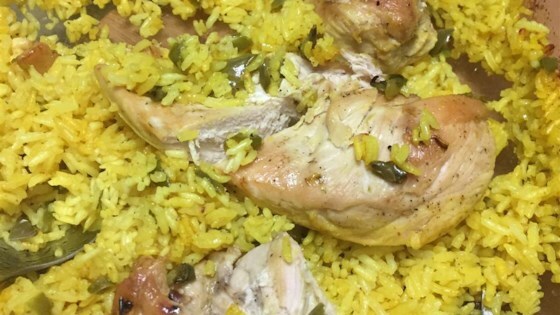 "Easy to make chicken and yellow rice, served just like at your local Spanish restaurant." Bring water and chicken bouillon to a boil in a large skillet. Add chicken breasts and bell pepper; simmer over medium heat until chicken is no longer pink in the center, about 20 minutes. Remove chicken and pour remaining broth into a 9x13-inch baking dish. Stir rice, plus the included seasoning packet, and olive oil into broth. Arrange chicken breast over rice and season with black pepper and poultry seasoning. Bake in the preheated oven until liquid is absorbed and rice is tender, about 45 minutes. Fluff rice with a fork before serving. This chicken and rice casserole is simple and tasty. My family including picky daughter ate this! Added red,green peppers and onions and garlic and diced tomatoes...fabulous! This came out awesome and it was so easy to make! I replaced the green pepper with green peas. This is the way I'll be cooking my Chicken and Yellow Rice from now on.